The final stage of the Design Competition has now ended, and I am so happy to see this many people voting for their own favorites among all of the beautiful designs that were selected by our panel of judges. We will announce the winners of this year’s competition shortly together with the winner of the voting competition. To conclude this interview series I will here be introducing you to two of our most appreciated and loved designers, Ralph Burkhardt & Samuel Coisne . Ralph Burkhardt is an award winning graphic designer from Germany with his own design firm, Burkhardthauke , which he started together with his business partner Daniel Hauke. Together they have been working on both big and small projects for many different companies successfully for many years. Ralph mostly focuses on prints and is also working on different online projects, so when entering in our Design Competition in 2010 this was a first for him in designing a carpet. Participating in the Design Competition is something that has had a big impact on him in the way he looks on design and designing. Check out all of his designs here at CarpetVista, Stepping stones and Flaws are still available to purchase through our website. Ralph usually works with graphic designs and patterns in black and whites, and when here given a chance decided to bring some color into his designs. As one of the winners he had the privilege to also see the final product, to see how his design translates in real life in regards to color and structure. At the moment he is working on a Design manual for print- and typographic design, and this is something that gives him great pleasure and pride. This is a way for him to share his knowledge and to help other designers on their way. Ralph is a hard working and principled man who believes in putting the clients needs first, but for him it is also important to make sure that he works with likeminded people. He screens his clients through a thorough selection process to be able to find the projects that suit his company as well as his person, and of course where he feels he has the biggest chance to make an impact for his customers. He sees himself as precise, open-minded and enthusiastic. Getting up early every morning is a must for Ralph. He goes up early to be able to have the necessary time of getting up to speed with news, blogs and current events. Ralph uses this input to find inspiration outside his normal work in graphic design, as well as being inspired by everyday life doing the things that he loves; reading a book, going to an art exhibit or travelling. This helps him to get a new perspective on things. His home reflect the work that he does and him as a designer, with clear shapes and quite toned down in regards to color and with a large quantity of books to add some personality and color in his home. The final stop in this voyage takes us to Belgium via France, where we say hello to Samuel Coisne. Samuel is born in France but studied visual arts in Belgium, and has since 2004 been self-employed and living and working in Brussels. With a background in art, drawing and sculpturing, Samuel is more of an artist than a designer in the traditional sense. He engages himself into different projects and exhibits, sometimes just to sooth his creative desires. With an open mind he tries to always be aware of his surroundings giving him the chance to be inspired in his every day life. Samuel is as you may have guessed a very creative person and he does not feel that his work can be compartmentalized. He tries to see himself in a wider perspective over time doing where he is doing what he feels make sense and letting time shaping his characteristics. It is important for him to create something that is understandable and accessible to his followers and clients.Last year he was invited to present a solo exhibit in Beirut, an experience that has greatly influenced him. Spending two intense weeks in Beirut, only concentrating on his art and finding himself affected by the situation in Lebanon and the contrast from his everyday life. Entering the Design Competition and being one of the winners in 2007 is something that has had a major impact on Samuels’s life and career. After finishing school in 2004 Samuel almost stopped designing completely and had a serious think through about changing career. For a couple of years he focused on other things but still having at least one foot left in the industry, for instance working at art galleries and creating websites. He found himself in somewhat of a breaking point in his life. Having a winning entry in the Design Competition was a reawakening for Samuel and this gave him energy and confidence to continue and pursue his career within Design. Samuel is the creator of the beautiful cityscape designs from Stockholm , London , Tokyo and with the New York / Manhattan landing him a win. The main advice that he wants to share with anyone trying to seek a career within art and design is to really believe in them selves. Samuel lives in a cozy loft apartment in one of the older more characteristic buildings in Brussels. A unique building shared by different types of artists since 1874 thanks to Felix Mommen. This is somewhat of a shelter for likeminded, creative and interesting people living in their own community but still making sure that everyone has a life of their own. The most important place in his apartment is an enormous window where he spends his time pondering, creating and just admiring the sky. His home is quite sparse with some pictures on the walls from painters that he likes (for instance David Hockney) and drawings from some friends. To quote Samuel and for you to try and get the feeling and vibe of being in his home, there is ”always music and never TV”. Marta Pineda is somewhat of a uncharacteristic designer. She describes herself as curious, passionate and persistent. In addition to these rather creative personality traits she has a degree in both design/photography and sales/marketing. This gives her a unique perspective on design in general, and offers her a different and interesting starting point when taking on a new project. For her it is important not just to create something that is esthetically appealing, but also has a function, purpose and is sustainable. A lack of structure and realistic thinking is otherwise common when dealing with creative people, and therefore her sales and marketing background offers the possibility of focusing on an actual need or function. This is something that we see in her campaigns, products and designs, and targeted ideas which are well thought through. Marta’s main advice for anyone who wants to start a career in product- or interior design is quite simple. Make sure to get a proper education to build on and through hard work this will enable you to follow your dreams and ideas. Her interest in design started early and she thanks her parents a lot for giving her the opportunity of studying at a school where the students were given creative freedom, a chance of being close to nature and taught sound values. And a lot of this translates in her work as it is seen today. Today Marta collaborates with many different types of companies in both creating marketing designs and also with styling display windows and stores. As a designer she is attentive to her clients needs, and does not see the need of putting too much of herself in a product or a design just because she is able to. The end result is always the most important priority. Marta constantly focuses on educating herself, evolving in the way she works and finding new approaches in addressing an issue. She spends a lot of time doing research to make sure that she is well prepared both in her existing projects but also with future trends and needs. It is important for Marta to keep her eyes and ears open when a new project is in the pipeline. Going to the movies, eating at restaurants, listening to new music, reading books and shopping are just some of the different scenarios where she is searching for inspiration and ideas, surrounding her self with as many impressions as possible to help stimulate her imagination. She describes this work process as being “like a hound with his nose to the ground”. All of these different impressions are then sifted through an invisible funnel, and a new idea is born. Marta was one out of three winners in the 2009 edition of the Design Competition with her contribution Piedras. The idea behind this piece was to promote the simple and to show that simple can be beautiful. Working on this piece defined Marta in the way she takes on a challenge in regards to her creative process, a process that she still lives by. The following year Marta once again was amongst the top contenders in the Design Competition of 2010 with her piece Mediatarde. A design that promotes serenity and homeliness, a place where time stands still and you are able to unwind and just be yourself. This design is more than just a carpet, it is an emotion. Marta prefer spending her spare time out in the nature, which is a calling for her just as important and stimulating as her passion for design. She lives in a house with nature and stunning views literally on her doorstep, and loves to spend her days working in the small garden looking out over the mountains surrounding her home. Marta is an active person, always out running and taking long walks with her dogs. This is a way for her to disconnect from the busy world out there and suppress her creative mind, to be able to just relax and enjoy life. It takes no time for her at all getting out of bed and going to work. Starting the day early answering her emails and calling customers, with her studio and office on the first floor of her house. When working with different types of customers and projects it is important for her to be able to be flexible in her day and with the different obstacles that will come in her way. Her advice to others is to focus on creative tasks just after lunchtime, and this revelation has undoubtedly helped her with her own time managing skills. Marta’s preference when it comes to interior style is a mixture between Nordic design and industrial elements. Clean lines with light and natural coloring, incorporating natural wood and raw materials. She appreciates furniture and design with an actual function and she praises multi functionality when it comes to interior settings. In her living room she has her own Mediatarde carpet on display, surrounded with blue and turquoise colors complementing each other. Marta is inspiring both as a person and designer, and for me I cannot wait to see what comes next. I hope that you can’t either! Don’t forget to participate in this years Design Competition before the 9th of September. Take the chance of being our next big designer. Martas TOPPICK is one of our beautiful and luxurious Afghan Khal Mohammadi carpets. Hand knotted carpets from the northern parts of Afghanistan, famous for their luscious red nuance. For more information on Marta Pineda, check out her website here. Our annual Design Competition was launched as a means to seek out and find up and coming talented designers, and to help them on their way to greatness. This year CarpetVista is celebrating 10 years in the business and to commemorate all the talented designers who have cooperated with us during all of these years I am during the next weeks going to introduce you to some of our designers. Design Competition 2015 - MEET Cajsa! First out is a young woman from the middle parts of Sweden that is competing in this year’s edition of the Design Competition, her name is Cajsa Wessberg and she has just graduated after 3 years at Beckman’s College of Design.I had the privilege of taking part of her final exhibit this spring, where she showcased her work with a carpet from CarpetVista. This interview is meant as an introduction to her work and a opportunity for you to get to know the woman behind the designs. Cajsa describes herself as a thoughtful and imaginative person and her interest in design started early. When deciding which direction to continue studying after High School, she chose between either law or art. Which could seem as two rather distanced professions and views on life, but maybe this helps to explain the intriguing person behind the designs. Her main source of inspiration comes from observations in everyday life; chunky people and animals, food and all things odd. And this playfulness is of course present in her work. She mentions Tove Jansson and Josef Frank as people that truly inspire her, with a strong appreciation of the way that they compose patterns and illustrations. For the future she can see herself working in the interior business, converting her illustrations into interior prints and creating patterns and design for the textile industry. Despite these ambitious plans, Cajsa is very passionate about the environment and it is important for her to minimize her impact on consumption and general strain on the environment. She will soon be launching her web shop as a means to promote and sell her design collections Djur på hög and Köttdjur. Her examination project was the latter, Köttdjur. These funny little critters are meant to be used as teaching material for children in kindergarten, as educational tools to help children understand that the meat that we eat everyday actually comes from living animals. A fun and relaxed way of learning and at the same time to help reduce the impact that the meat industry has on the environment. Besides creating new illustrations Cajsa has a huge interest in interior design and she often spend her time building settings both in her home and her mind. She describes her home as a mad contradicting mixture between a five year olds playfulness and naive look on life, the homeliness of an old lady’s apartment and with elements found in a misunderstood teens room in the 90´s. Her home is filled with stuffed animals, lace, Carl Malmsten-furniture and shot glasses enclosed in flames. An interesting mix of styles and ideas that gives us a good idea of who Cajsa is. This is the first part in my upcoming series of interviews presented through our website and we hope that this will help to inspire you. If you feel tempted to participate in this years Design Competition, and to have the chance of your design being produced and sold on Europe’s largest trading place for textile art, just follow the instructions in this link. I hope to see many beautiful and inspiring entries, and to meet interesting and inspiring designers. The last day to submit a design and to participate in the competition is on the 9 th of September. Good luck to all of you! 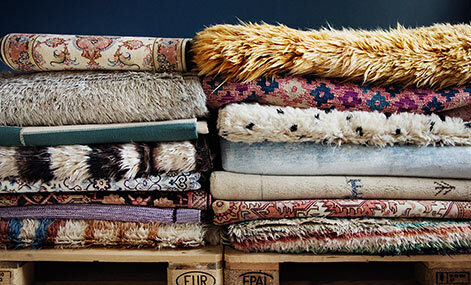 Cajsas TOP PICK is our wide assortment of soft, cozy and luxurius shaggy carpets, our Shaggy Collection. The Patchwork carpet is a wonderful joint venture of new and old. The raw material used for making these Patchwork carpets come from older, mainly Persian or Anatolian carpets, of at least 30 years of age. After selecting which carpets to use, they undergo a unique process in which the pile is polished, coloured and finally cut into different size pieces. 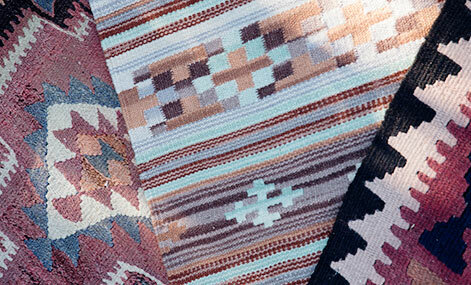 The best pieces are then joined together by skilled designers to form exciting new Patchwork designs. 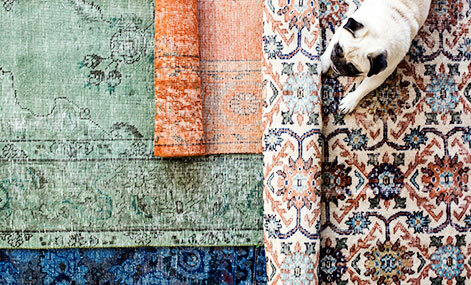 Pieces of carpets from different cultures and eras meet to form a new whole. A fabric backing is attached to the base and the pieces are sewn together. The result is a durable carpet with a unique history and modern splendor of colour combinations. The old carpets get a new life and create a mosaic of stories and opportunities. Joyful, happy, rejuvenated - these are just some of the emotions that are evoked with the coming of Spring. When Spring finally arrives after a long winter, we have a natural tendency to surround ourselves and our decor with more colors. They makes us feel energized and awaken some of the senses that have been somewhat dormant during the gloomy colder months. When you are finished with the Spring cleaning consider adding a splash of color to your floors and welcome in the warmth to your home with a new carpet. 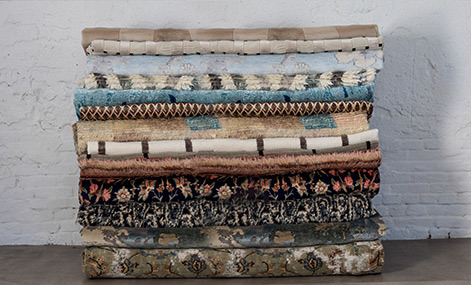 Why not opt for a bold and daring multi-colored Patchwork or maybe even a hand-knotted nomadic Ghasghai, Lori or Afshar carpet? 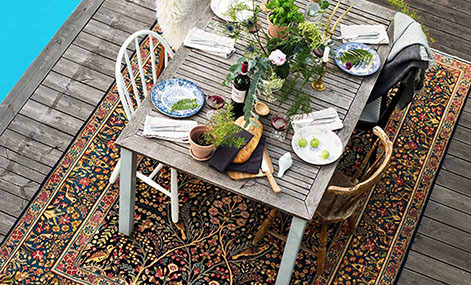 For those seeking a more contemporary style, a single colored Handloom or modern designer carpet such as the ones shown above could be the perfect way of welcoming Spring into your home. Interesting facts on handmade carpets. Kerman - "Dance of the Nymphs"
Kosta Boda limited edition rugs in stock!